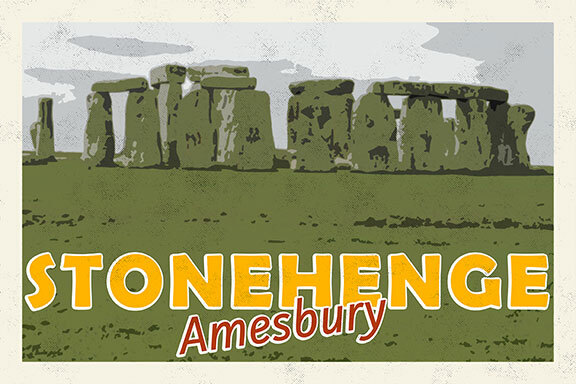 Stonehenge “postcard” that I created from one of my photographs. Welcome to 2015 and this year’s first Thursday Writing Prompt! In honor of New Year’s Day I thought I’d give you a prompt that involved a new location and a new year, although not necessarily “new” in the sense of a linear timeline. Imagine that you fell asleep after your New Year’s Eve revelries (or in front of the TV) and when you woke up the world around you was literally different. Instead of resting comfortably in bed or on the sofa, you awake to find yourself wrapped in a linen blanket and nestled in a pile of straw. And yes, there’s probably a flea or louse or some other unwelcome beast sharing the straw with you. You jump up, noticing that the walls surrounding you are earthen walls. You panic and run outside. Your hut is just one of many small rough-built structures clustered along the edge of what appears to be a building site in an open field. Your mouth drops open when you see the massive stone sentinels — it’s Stonehenge — only it hasn’t been completely built yet. Okay, now this is where you pick up the thread of the story. Who are you and why are you at Stonehenge? How did you get transported back in time? And just what is Stonehenge?